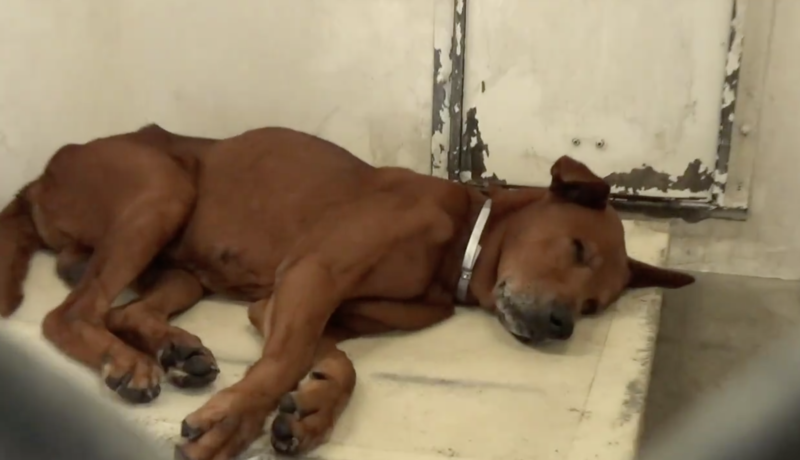 Carson, Calif. – A male, senior Chow-mix was dumped after serving his masters for 16 years of his life. Sixteen years is a fraction of a human’s lifetime, but it is an entire lifespan for most dogs. Named Toby, he is at the tail-end of his life. According to the facebook description, posted by the compassionate ladies who visit the Carson shelter and run the Facebook page, Saving Carson Shelter Dogs, Toby was banished to live outside all of his life. TOBY had a lonely, horrible life we just found out. He was NEVER allowed in the house while we all were inside during the extreme heat or cold nights and strong rains. For 16 years he was outside, loyal and lonely and all they did was feed him and go back inside. Now that we have this info we know he deserves to know how it feels to sleep on a bed inside a home for once in his life. He’s 16 and he just wants to go home. The post also stresses that because Toby is labeled a Chow, he will need a temperament test, which could take weeks. The Carson ladies took a couple of videos of Toby at the shelter. At his ripe old age, he appears thin and quite weary – oblivious to the cries, yelps, growls and barks of other shelter animals. Yet, when called, he curiously walks over to the front of the run. His graying muzzle gets a little closer to take a treat. Toby needs a savior. He needs someone to take him home and allow him to be an “inside dog” for the first time in his life. He needs a place where he can rest his old bones on a soft bed. He needs to feel loved, wanted. He needs to belong. He deserves all of these things. They will be foreign to him, but there is no doubt he will both welcome it and be grateful for it. Such is the nature of the canine species. The following is more information about Toby. Hours of operation: M-TH, 12 noon – 7 p.m.; Fr-Su, 10 a.m. – 5 p.m.
Be the first to comment on "Senior Chow dumped at shelter needs to experience the comforts of home"